In my post, Three Critical (and Simple) Tactics for Boosting Your Online Fundraising, I talk about simplifying the path from clicking on your website or email to making a donation. For this blog, I want to dig in a bit more on a subject that I think makes a big difference in optimizing your email fundraising efforts AND one that I love talking about: calls to action. CTAs are those buttons or graphics that grab donors’ attention, getting them to focus on what you want them to do. Whether you’re trying to get donations, volunteers, or signatures on a petition, call to action buttons are the number one driver of click-throughs on your emails, website, and other marketing materials, according to Campaign Monitor. Let me know if you have questions by emailing me at sarah.barnes@campbellcompany.com, and feel free to weigh in below in the comments section. What's the purpose of your CTA? Though it may seem obvious, it’s critical to know what you want your audience to do before you start drafting any digital communication. What is the action you want them to take? The call to action is the center of your email, so make sure the rest of the text supports the message well. If a communication needs to answer the questions “who, what, where, when, and why,” the call to action’s main focus should be the “what.” Asking contacts to donate? Make sure the rest of the page establishes why that donation is important. Looking for volunteers? Give details on what a volunteer shift would look like and how urgent the request is. And don’t be afraid to get a little more specific—if you can tie the call to action directly to a compelling outcome, your supporters will be more likely to click. As I mentioned in my last post, remember your audience. Research has shown that using first person can result in higher clicks. Between planning, drafting, and scheduling, you’re investing precious time in each communication you send out. To inspire your readers to click through, make sure your call to action is powerful and tailored. Where should the call to action go? Think hierarchy. Often, you’ll have other messages, links, images, and buttons that need to be included in your email. Remember, your email should be developed with your call to action in mind, so all the content supports and drives attention towards the call to action—both in terms of what information the content presents and how it’s arranged on the page. When laying out your email, you want to format everything to visually draw attention towards the call to action. To make it stand out, you can put the CTA on the right-hand side, away from text, or in the middle of the page, where it will draw viewers’ eyes. The CTA should be high up enough on the page that your donors don’t have to scroll down to see it. To make sure your audience sees it, you can also supplement the main call to action with duplicate links throughout the email—a CTA button and one or two additional links in the body of the email can work well. When balancing between your main CTA and other messages, think about what’s most important to readers. How can your other messages and CTAs be represented appropriately? Remember, don’t stuff your emails with too many messages. If you’re having a hard time fitting in everything you want to say, consider whether you might need to split your content over multiple emails. It may mean more work, but it can also mean more engagement. How should your CTA look? Let’s start with the research. According to Campaign Monitor, using a button-based CTA can increase click-through rates by 28% over a link-based CTA. Button-based CTAs are easy to read and immediately noticeable. And as your audience likely has an inbox full of emails competing for their attention, being immediately noticeable is critical. When designing your button, color is a powerful tool. Make your button a specific color that contrast to the rest of your email while still lining up with your brand guidelines. For example, if your primary brand colors are blue and orange, make most of the email blue but use orange for the CTA button. If white is one of your primary colors, try a white background for your email and your main color for the button. And don’t be afraid to use one of your secondary brand colors if your primary colors don’t provide enough contrast! 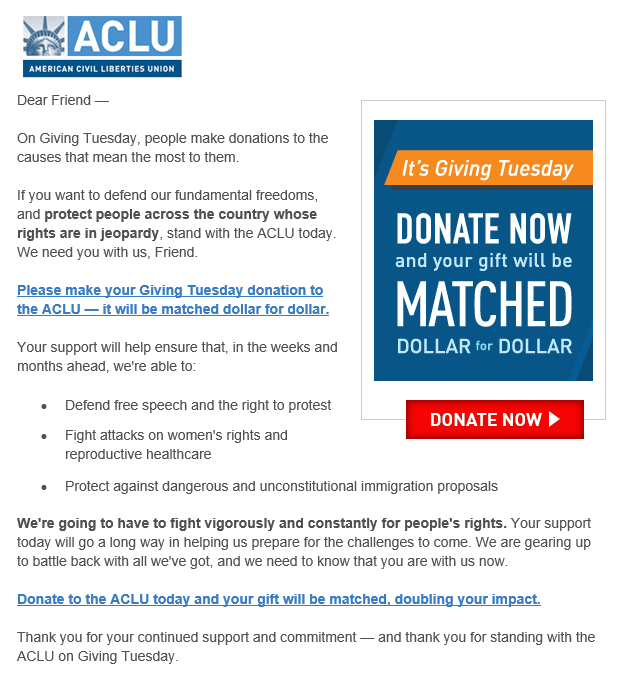 Here’s an example from the ACLU’s #GivingTuesday effort. Everything in the email is about giving, so readers are getting one coherent message both from the CTA and the rest of the text. When opening this email, the red “donate now” button is the most eye-catching element, followed by “your gift will be matched dollar for dollar” in blue, showing donors the “what” and the “why” in quick succession and inspiring action. And since the ACLU included two giving links in the body of the email, the reader can easily click to make a donation from any point. Start with tackling these three critical features of CTAs, and stay tuned for more information from our Digital Fundraising team! As an Online Fundraising Consultant, Sarah Barnes works with organizations to optimize their online presence through analyzing data that ultimately reveals strategies for the future. In her work with clients, Sarah most values opportunities to review and assess online data from multiple channels such as an organization’s website, social media channels and email marketing initiatives, to inform decisions, as well as working closely with organizations to brainstorm and identify and optimize strategic online fundraising initiatives.